At Dustin all our facilities are governed by the same overarching policy framework. 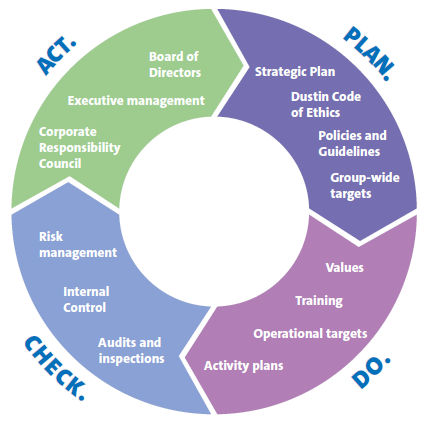 Dustin’s group-wide quality, health & safety and environmental policies and strategic objectives for respective area are implemented with the aid of a management system and Lean Six Sigma methodology. The management system helps us to work systematically, continuously and preventively. We integrate quality, health & safety and environmental protection throughout the organization with the help of identified key processes. Our purpose is to make quality, health and safety a natural part of every employee’s daily job and to strengthen and maintain a responsible corporate culture. We also encourage suppliers to view quality, social responsibility, health and safety and environmental protection as a journey of continuous improvement. Dustin Group’s Quality Policy outlines our commitment to work with continuous improvements with a strong focus on the customer. Customer satisfaction is measured monthly and is the foundation when prioritizing and delegating resources to improvement projects. Dustin Group’s Health & Safety Policy outlines our commitment to a healthy and safe working environment. We acknowledge that our employees are key to our success. Providing a healthy and safe working environment is essential to our business and in line with the ethical standards defined in our Code of Conduct . Our ambition is to have a workforce that is motivated and healthy - physically, mentally and socially. Our commitment to environmental protection and prevention of pollution is outlined in our environmental policy. Through efficient and environmentally sound business practices we aim to reduce the adverse environmental impact and use resources efficiently. We utilize life cycle thinking in our work to continuously improve our own environmental performance but also to more holistically work with the environmental impact of the products and services we offer our customers and consumers. In Sweden our business is certified in the areas of quality, the environment and health and safety. Our certification demonstrates that we strive to achieve efficient use of resources, holistic risk management and increased customer satisfaction. 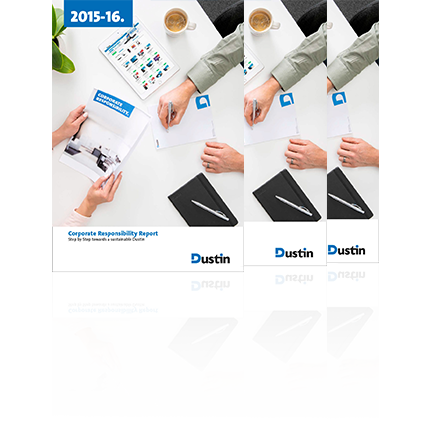 Dustin Group’s Quality Policy outlines our commitment to work with continuous improvements with a strong focus on the customer. Customer satisfaction is measured monthly and is the foundation when prioritizing and delegating resources to improvement projects. Dustin Group’s Health & Safety Policy outlines our commitment to a healthy and safe working environment. We acknowledge that our employees are key to our success. Providing a healthy and safe working environment is essential to our business and in line with the ethical standards defined in our Code of Conduct. Our ambition is to have a workforce that is motivated and healthy - physically, mentally and socially. How are we doing in terms of health & safety, environmental protection and social responsibility? Have a look at our latest Corporate Responsibility Report.